If they only appear in schools, they should not be in schools. Imagine the feeling you get when you walk into a trendy coffee shop or a new space in a friend’s home. You can imagine yourself being productive, losing yourself in a book, or on an endless internet search for something that’s piqued your interest. There’s a near-certain chance that this desk was not part of your ideal space. 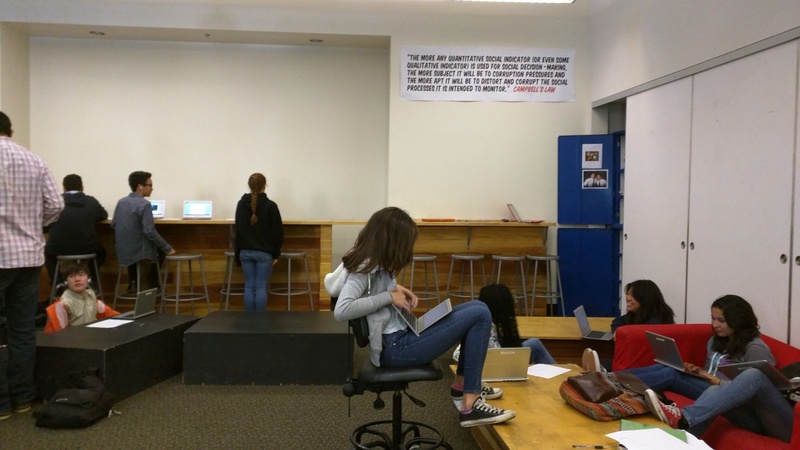 I was out at High Tech High back in March and the classroom space is awe-inspiring. I’m here again this week for their Winter Residency and there are some design features worth sharing. 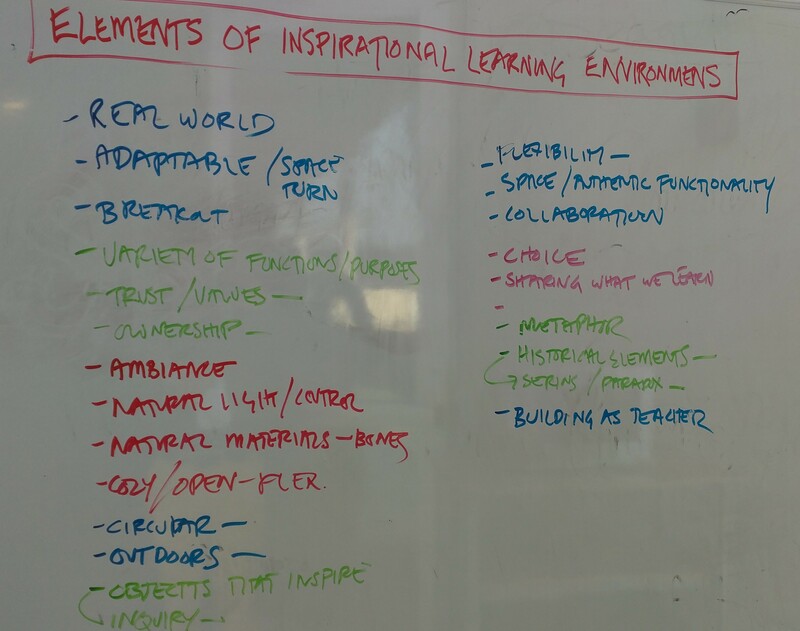 As we plan for the fall rollout of Innovation Lab, we hope to propose including many of these same ideas in our own classroom redesigns. A big term we heard a lot is work time, similar to our own studio time. It’s time students have to work on their projects. Students told me this time is more than 50% of their overall experience. You’ll notice students below working at tables, on couches, at breakfast bars, etc. Work time represents a bit of a departure from your typical view about engagement in a classroom. Students are engaged – they have a task, they’re working, they’re asking the teacher if needed. Some students have headphones in and, yes, there’s the occasional check of a text message. A high school sophomore talked of the respect they have for teachers and teachers have for them in this environment. A high school teacher described their work time as similar to our own work environments – as teachers, we will be very engaged in planning a task or meeting with a team. Later, we might be more relaxed and listen to music or check a message as we work. He noted that at any office, one wouldn’t expect 100% total engagement and no distractions for an entire work day. His opinion when pushed about students misusing technology? What they’re doing at school needs to be exciting and meaningful enough for them to be as engaged as us. 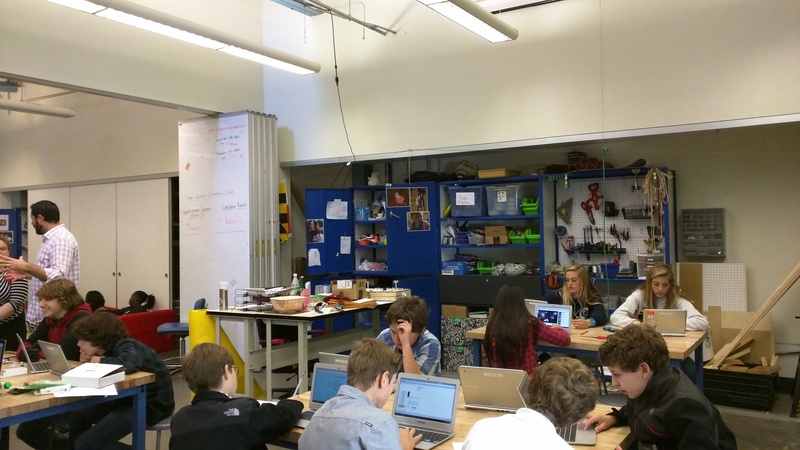 This is a shift from our own traditional thinking of what a classroom should look like. Look past the students to the blue cabinets. Inside, there is a Chromebook charging station, various tools and supplies (clams, ropes, pliers, painting tape, screws, etc.). Notice the wood scraps by the girls on the right. The white closets on the right serve as storage and as a place to write. There’s a couch and some black/wood boxes that serve as either seating or as a table. In the back, there are high stools and workspace. Behind it is a Chromebook charging station. 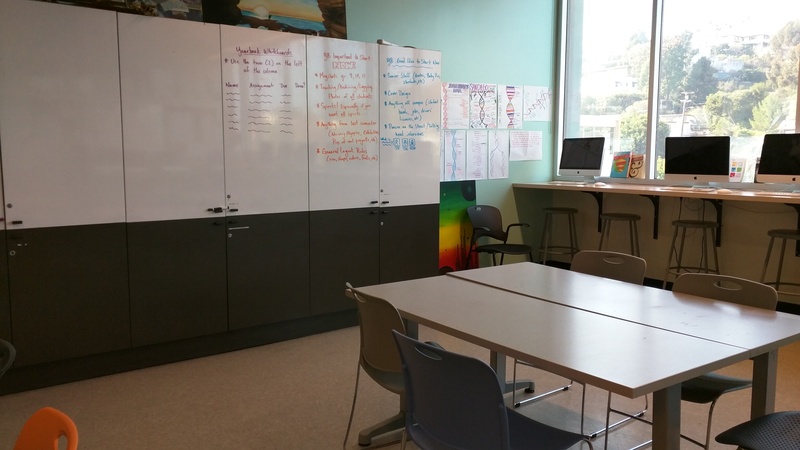 Writable surfaces? Doubly useful. These cabinets serve as storage and an area to make a note or brainstorm. High stools in the corner are easy to stash away under the computer bar. Marc Shulman was the math/science teacher for this grade. 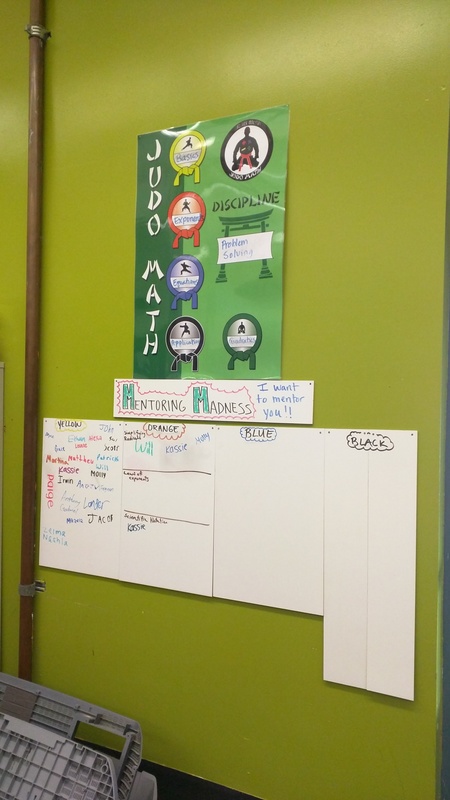 He has developed his own system for teaching math; one aspect I liked was his “mentoring maddness” wall. When a student feels confident with a particular math topic, they can voluntarily write their name in the space and other students then know who to approach for help. 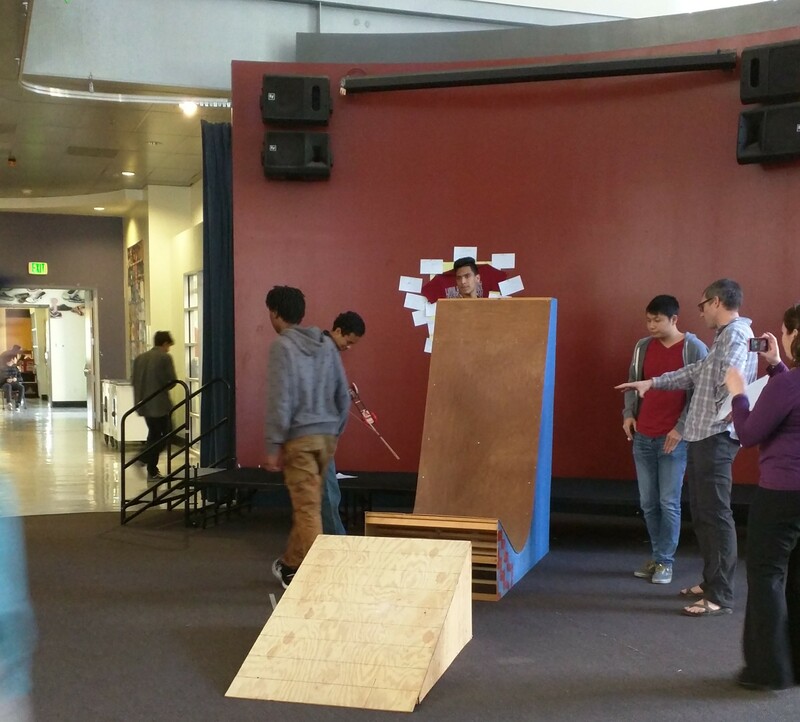 Students in a Physics class built mouse-trap cars and are collecting data about how far they go off of a ramp. The atrium they are in is common to all of the High Tech schools – it also serves as a meeting area for teams or the school. This is a corner of an 11th grade room. They are all multi-purpose, but this one is used a lot for bio. There is a hood in the back for science purposes. I saw this on my way out today. Lots of good stuff on here.